The Paramount served as a movie theater for several years. Before the civil rights era, African-Americans could only enter the theater via a segregated entrance on Third Street. The theater closed its doors in 1974, and remained vacant for 30 years. In 2004, a $16.4 million renovation project reopened the doors of the theater. 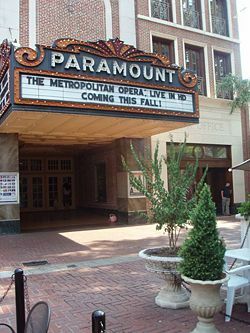 The non-profit Paramount Theater, Inc. purchased the building in 1992 and received grant funding from the City of Charlottesville. The first project was to restore the original marquee on Main Street. The Washington architectural firm Martinez & Johnson Architecture, alongside Charlottesville's Bushman Dreyfus Architects, oversaw a renovation project that sought to both restore the theater and to create new facilities that would allow the Paramount to become a regional performing arts center. Amenities installed include a modified fly loft, backstage areas, orchestra pit, and a three-story annex building with computerized box office, ballroom and meeting spaces, and a community rehearsal room. The Paramount opened to the public once more on December 15, 2004. Donations have been down since the financial downtown began in 2008. The Paramount had a fund balance of $479,000 at the end of its fiscal year on June 2008. One year later, the Paramount had a defecit of almost $303,000. On June 30, 2010, the deficit had increased to nearly $600,000. Strategies for survival have included finding angel investors to cover the booking fee for large acts, showing classic films on a regular basis, and seeking to lower ticket prices to get more people to attend events. ↑ 1.0 1.1 Web. Recession takes a toll on area's cultural scene, Bryan McKenzie, Daily Progress, World Media Enterprises, December 10, 2011, retrieved December 12, 2011. ↑ "The Paramount Theater: Our History." The Paramount Theater: Charlottesville's historic Paramount Theater is bringing a world of arts and entertainment to Central Virginia. Web. 19 Oct. 2009. <http://www.theparamount.net/about_ourhistory.aspx>. ↑ Web. The Paramount Theater of Charlottesville Named 2017 OUTSTANDING HISTORIC THEATRE by the League of Historic American Theatres, Press Release, Paramount Theater, retrieved August 3, 2017. This page was last edited on 3 August 2017, at 11:33.